Everyone has a story. Some are simple and predictable, and you know the ending before you finish the prologue. Others feel more like a Goosebumps book, with every chapter forcing seemingly life altering decisions. One of my favorite aspects of working in Minor League Baseball is the opportunity to meet and talk to many different types of people and hear their stories. Fans, boosters, scouts, reporters, families, players and coaches from all over the county and the world come out to Eastwood Field over the summer, and they all have experiences to share. Throughout the offseason I’m going to interview several former Scrappers in an attempt to give you an insight into their offseason life and tell a little of their story. This week I was lucky enough to speak with 2013 Scrappers first baseman, Nellie Rorriguez. Nellie Rodriguez looks like a ballplayer. With his broad shoulders, wide stance and boyish grin when Rodriguez’s bulky 6’2 250 pound frame walks into a room, there is no mistaking that he was born to play baseball. That passion has fired the New York City native through countless practices, conditioning sessions, workouts and of course, baseball games. At nineteen, Rodriguez leads a far from typical life. February through August he wakes up, works out, goes to practice, and then plays baseball. There are no weekends, there are no vacations, and there are fewer off days then you have fingers. His life fits in a suitcase because as a baseball player, he can relocate at anytime with only a few hours notice. Every three to five days he finds himself on a bus to a new town and new hotel. He travels the country the way many of us wish we could, one ballpark at a time. Like many kids who go away to college at his age, Rodriguez spends months without seeing his friends and family. When asked one of the highlights of the summer Nellie didn’t hesitate to answer the Scrappers trip to New York. On the above mentioned trip to New York the Scrappers faced McNamara Division rivals the Staten Island Yankees and Brooklyn Cyclones. The team was one game separated from a twelve game losing streak, but during the six days in New York they took two games a piece from both Staten Island and Brooklyn winning back-to-back series for the first time that season. A little home cooking and family time did him well and in Rodriguez’s first game back in his home state he went 4 for 5 with a double, two homers and five RBI. He went on to have four more multi hit games, another homerun and two more doubles giving him a .464 batting average for the two series. Rodriguez’s performance was noticed by both the Indians and the league garnering him Indians Minor League Player of the Week and New-York Penn League Player of the week honors. To state it simply, he put on for his city. When asked about the greatest moment in his career Rodriguez could have answered the series’ in New York, the 2013 New York-Penn League All-Star Game, getting drafted in the 15th Round of the 2012 MLB First Year Player Draft, or shattering Manny Ramirez’s high school home run record (both attended George Washington High School in New York City). Instead, he values his two walk-offs at Eastwood Field. Still a teenager, Rodriguez demonstrates something most adults struggle with, putting a team’s success over an individual’s stellar performance. When asked how he plans on spending his down time over the next few months, Rodriguez responded like any average teenager, “hangout with my friends, go to the movies a lot, go bowling, and just talk about life”. For those, who are fortunate enough to listen, his story is far from average. The Minor League Baseball world has been set ablaze this week with the announcements of new team names and logos. Most notable to our area is the rebranding of the AA Indians Affiliate Akron Aero’s to the Akron Rubber Ducks. The community as well as the industry has been very vocal about the name change, and it got me thinking, what’s really in a name? If you’re a girl in your mid twenties like I am, you have probably thought about what you want to name your future children. When it actually comes time to pick a name you may pour over baby name books, write out different monograms, or practice saying the name over a PA system. With some of the bizarre names in Minor League Baseball it’s easy to wonder, do teams spend as much time and thought agonizing over a team name? To answer simply: no. They spend a whole lot more. In sports, a name is more then simply what you call a team, it’s an identity for a fan base and for players to latch on to and identify with. A team name should pay tribute to the history and culture of the area as well as embody the attitude the team hopes to exhibit. So what does it mean to be a Scrapper? Thesarus.com gives twenty-six synonyms for the word “scrappy” but what comes to my mind is the concept of doing whatever it takes to win. When a person is “scrappy” they are often an underdog fighting their way to succeed. Baseball is, at its core, all about scrappiness. It’s about a batter fouling off pitches to stay alive or attempting diving catches for foul balls. Is there anything more scrappy then bunting for a base hit? Now-a-days flashy plays make web gems but scrappy players win games. 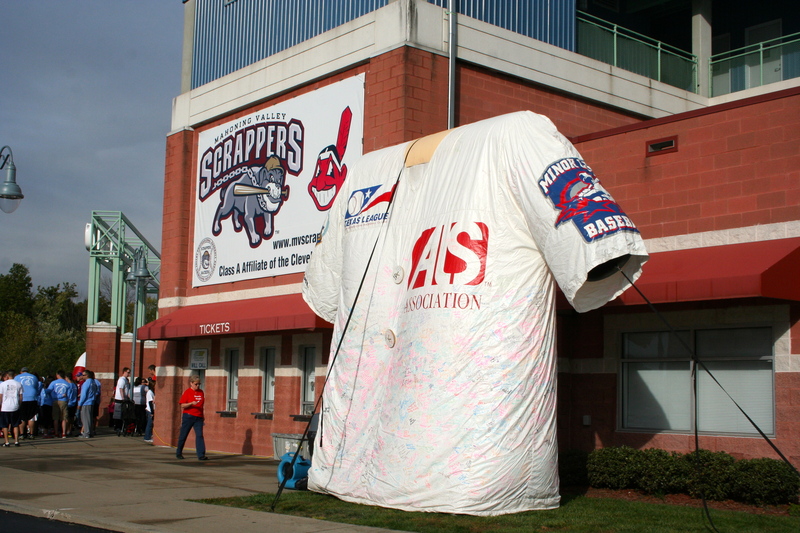 The concept of being scrappy has regional ties to the Mahoning Valley as well. Though the industry has somewhat faded, the area is historically known for producing steel metal. The name “Scrappers” not only identifies with the industry but also of the tough, resilient, never back down nature often associated with the people of Northeast Ohio. There is a sense of pride with being scrappy, and this team is very proud to be to represent Mahoning Valley and everything it stands for. October Baseball. Are there two better words in the English language? Maybe “Opening Day” or “Play Ball” but other than that you would be hard pressed to find a better combination of two words that instill the excitement and anticipation that October Baseball does. This month young Pirates fans experienced the bittersweet post season for the first time. The city of Boston rallied behind a beard. St Louis placed their hopes on the shoulders of young rookies that have gone above and beyond every time they have been asked to take the mound. It is emotionally charged baseball on the biggest stage. With Game 6 just a few hours away I got to thinking, how many former New York-Penn League players are playing in the World Series? Both the Red Sox and the Cardinals have New York Penn League affiliates, so odds are good that a few of the players you’ve seen in the league have made it to the big show. However, the fact that there are eighteen players currently listed on World Series rosters is incredible. Six of the eighteen players have been selected to the Major League Baseball All-Star Game and these New York-Penn League alumni have combined to win four Golden Gloves, three Silver Sluggers, Comeback Player of the Year Award, American League Rookie of the Year, and a Roberto Clemente Award. Even more mind-blowing, thirteen former New York-Penn Leaguers comprise over half of St. Louis’ roster and six of those thirteen have played for Batavia (the former St. Louis Cardinals affiliate) in the past five seasons. These players didn’t only play for Red Sox and Cardinals affiliate teams either. Seven different teams representing half of the New York- Penn League have a former player in the 2013 World Series. So how does this all relate to the Mahoning Valley Scrappers? Most Scrappers are young, so young in fact that many had never seen a Pirates postseason prior to this year. They are fresh out of college or high school and starving to prove themselves in their first year of Professional Baseball. The New York-Penn League is a place for them to work out their kinks, refine their skills, and start to develop who they are as a ball player. Our games may not be as clean and orderly as Major League Baseball (excluding this very bizarre World Series) but that talent is here both on our roster and on the visiting teams’. Whether it be tonight or tomorrow former New York-Penn Leaguers will be crowned World Series Champions, and as cliché as it may sound, they started right here. This week the front office has a treat for you, our very own starbucks drake hands video! If you haven’t seen or heard of starbucks drake hands allow me to explain. One day a girl walked into a Starbucks. She thought the barista was cute and gave him her number. The barista decided to give the girl a shout, but instead of shooting her a text or giving her a call, he sent this video. The video has gone viral on youtube and several celebrities have spoofed it including Terry Bradshaw, Mark Sanchez, Larry King, and the Mahoning Valley Scrappers! With the announcement of our 2014 schedule, season tickets being on sale, and the pop culture tie in we couldn’t resist making our very own rendition. I hope you enjoy watching it as much as we enjoyed filming it! If you’ve followed the MLB Postseason on social media this fall, you’ve probably seen quite a few hashtags involving October. Major League Baseball started it all with #chasingOctober and several teams followed suit. We saw #Buctober in Pittsburgh, #oCtober in Cleveland, #OAKtober in Oakland, #Soxtober in Boston, and here at the Scrappers we’ve had #Walktober. Eastwood Field is home to the Scrappers for 38 home games between the months of June and September as well as YSU Penguin baseball through most of the Spring. However, it also plays host to several community events such as the recent Walk Now For Autism Speaks Walk October 5th, and the Northeast Ohio Defeat ALS Walk this past Sunday. 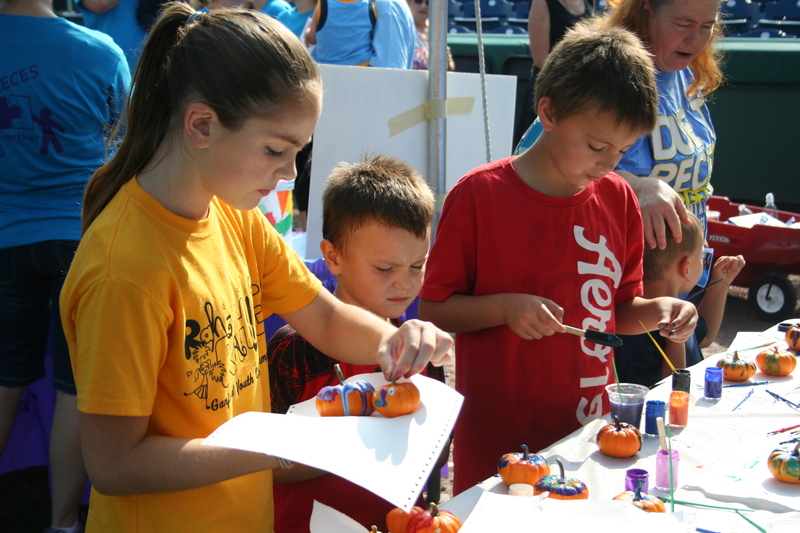 Pumpkin decorating at the resource fair. 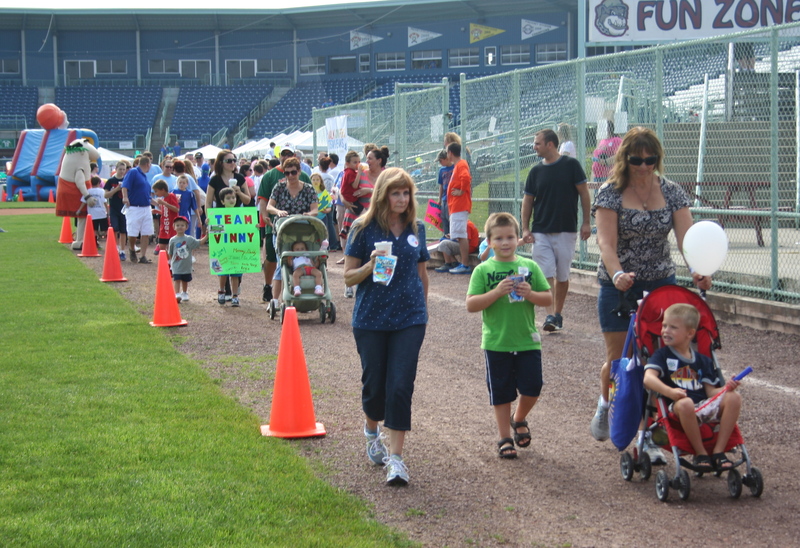 2013 Was the first year we’ve helped host Walk Now For Autism Speaks Walk and it proved to be a truly unique and impactful event. Autism Speaks began setup at 7am and by the time registration opened to the public at 9 the DJ was playing, tents were propped up and the resource fair was ready to go. My favorite part of the event was that Autism Speaks involved local businesses and groups through their resource fair. Ten tables at the fair were set up with information about Autism as well as an activities for kids who visited. After opening remarks, teams followed Scrappy on a one-mile walk around the ballpark ending at third base on the field. A personal element Autism Speaks incorporated into the event was having pictures of the different teams cycle through on the videoboard. Several people stopped to check out their team picture from the year before and some of their favorite family pictures that they had submitted earlier this fall. Walkers on the home stretch. 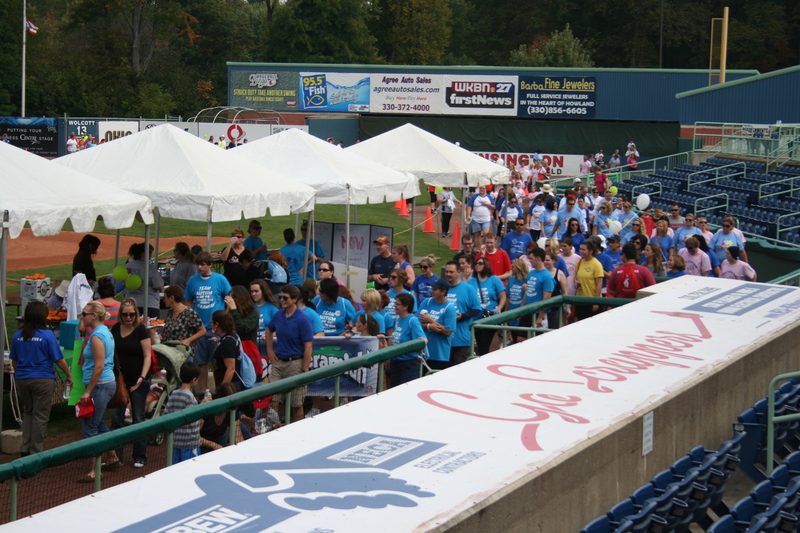 The following Sunday, the staff returned to Eastwood Field to help prepare for and host the second walk of the month, this time for the ALS Association. ALS, also known as Lou Gehrig’s Disease, is a cause that has had a profound effect on the baseball community. Hall of Famer and Yankee legend Lou Gehrig was diagnosed with ALS during the 1939 season. In what the New York Times called “one of the most touching scenes ever witnessed on a ball field” Lou Gehrig addressed Yankee Stadium, his critics, and his fans and thanked them for their support on July 4, 1939. If you haven’t seen Lou Gehrig’s farewell speech, I highly recommend watching it. 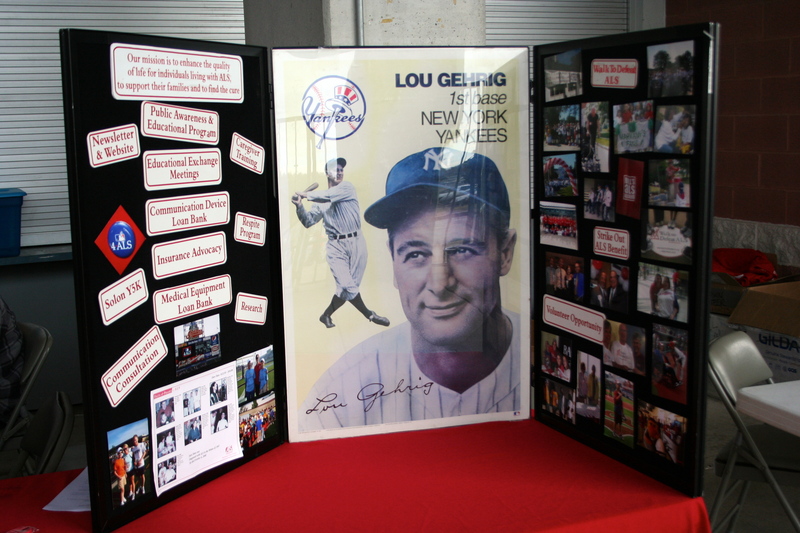 The ALS Association set up information about Lou Gehrig’s legacy, a giant inflatable baseball jersey signed by fans and ALS supporters from all over the country, and information tables around the stadium for walkers to peruse after registration. 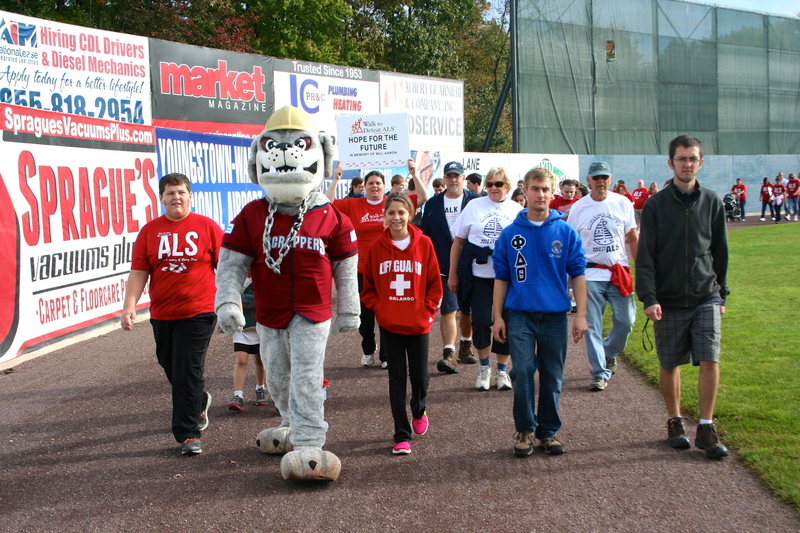 After an opening ceremony from the planning board as well as a statement from Miss Pennsylvania who recently lost her father to the disease, walkers followed Scrapper around the park to support ALS. Stephanie Novak and Jordan Taylor serving hot dogs and snacks after the Defeat ALS walk. 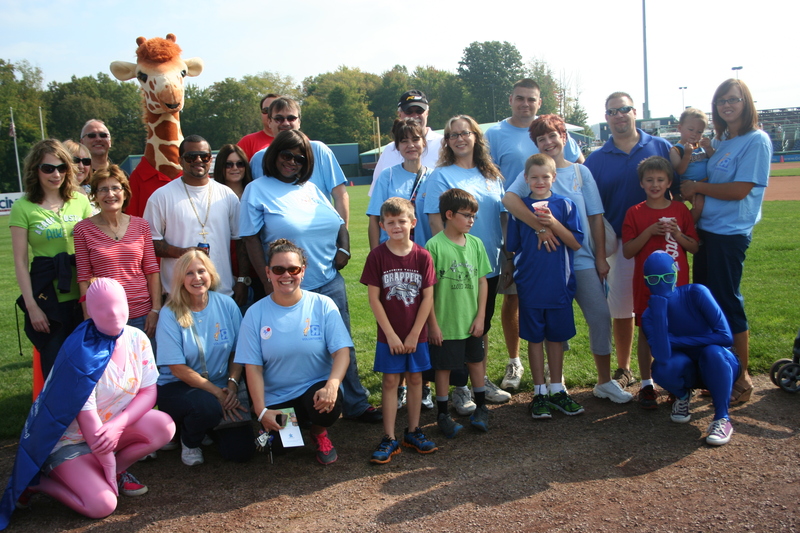 The Autism Speaks and ALS Association walks were my first two events since the season ended and proved to be a taste of how though we may only have games June through September, the Scrappers are part of the community all year round. It’s been a little over a month since the season ended. Players have left, the clubhouse is spotless and jerseys have been washed, ironed, and placed in storage. So what does a Minor League front office do in the off season? For starters, we don’t just look out the window and wait for spring, we plan for it. For the next few months it’s going to be planning, meetings, and then meetings about planning. Meetings often have the connotation of being long and boring. However, Minor League Baseball is not your typical business. Our job is not only to create revenue and provide a premium atmosphere for baseball’s top prospects, but also to allow our fans to have as much fun as possible. In an average weekly promotions meeting we may talk about 90’s boy bands, monkeys who ride dogs and herd sheep (check this out! ), Dancing with the Stars, and how one employee (who shall remain nameless) has never seen Boy Meets World. I’ll give one highly coveted front office signed baseball to the first person who can correctly answer who the employee is. It is in these meetings that the seeds for Zombie Apocalypse Night are planted and the not so great ideas like Tin Foil Appreciation Day are tossed to the wayside. The challenge is not only to predict what will be popular eight months from now, but also what fans here in the Mahoning Valley will like. We also take into consideration our brand image, and the reputation of our sponsors. A good promotions schedule should be creatively mesh both pop culture and the identity of the region while positively enforcing a team and their sponsors’ role in the community. Often times the best ideas and biggest office arguments happen while spit balling about promotions. Should we get our very own food truck? Would fans like a Rush themed fireworks show or a Drake Appreciation Night? Should we have a date auction? What does a fox really say? Should we have a Texas A&M football night or Ohio State football night? Shockingly, I’m always out voted on the last one. In this last week’s promotions meeting the gauntlet was thrown down over what is the best baseball movie of all time. Not so surprisingly we all had a different idea of what it should be, so we would like to ask our fans to help settle it once and for all. You never know, the winning movie may be incorporated into the 2014 promotions schedule! After a year hiatus, the Scrappers Scoop is back with a new look, new information, and a new angle. We all love summers at Eastwood Field, but this time around we’re going to give you a first row ticket to what happens in the off-season and the people who make Scrappers Baseball come to life every June. My name is Annie Stoltenberg (@astoltenberg) and after two summers of on-field hosting for the Scrappers I’m now a Marketing Intern this fall. Though I don’t aspire to be president of the American League anytime soon, I have known that I wanted to work in Minor League Baseball since my first baseball concessions job ten years ago. For me, Minor League Baseball embodies everything America’s Greatest Pastime should be. It is family oriented, it rewards hard work and resiliency, and it’s full of baseball magic. Why watch Minor League Baseball many people ask? Well, how many times have you seen an inside the park home run? I saw undrafted free agent Cody Ferrell hit one here at Eastwood Field this last season. What about a player hitting for the cycle? St. Louis Cardinals’ prospect Jimmy Bosco accomplished that very feat on June 26, 2013 in Mahoning Valley. Even more impressive, it was one day after he hit his first professional home run. Minor Leagues though sometimes unrefined, are often baseball at its very best. We often joke that there is no better stage for a reality tv show than a Minor League baseball office. Though we may not have as much drama as the “Real World”, everyone here has an interesting story. Every week I’ll post on this blog about my experiences in my first year working in a Minor League front office. Follow along to learn a little more about us, what life working in baseball is really like, and a lot more about the ins and outs of Scrappers Baseball.